Speech-language pathologists assess a child’s ability to communicate, both verbally and non-verbally, and offer treatment approaches designed to improve communication, utilizing augmentative and alternative communication when necessary. Communication is a broad term and includes not only speech articulation, rate and fluency, but also the ability to understand and express spoken and written language from non-verbal communication such as gestures and facial expression to initiating and improving verbal communication, conversation and discourse. Speech-language pathologists assist children to form words, learn to use words to build sentences, improve grammar, and improve reading and writing. Speech-language pathologists also assist children with feeding and swallowing disorders by working to strengthen a child’s orofacial musculature, improve proprioceptive awareness in the oral cavity, as well as decreasing sensory aversions to foods. 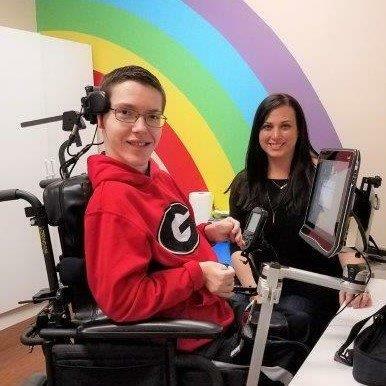 Our speech-language pathologists specialize in the treatment of children with developmental disabilities from ages birth to twenty-one, and will assist your child to learn to communicate effectively at home, at school and in our community.